Golfing has now become a "must-do" for me while travelling with friends. 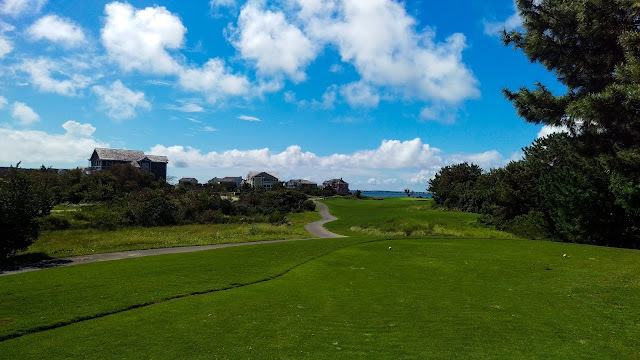 I recently went to North Carolina for a week and could not skip the chance to golf on the thin strip of land known as the Outer Banks. The course we chose to play was Nags Head Golf Links located in Nags Head North Carolina. Looking down the fairway of one of the holes at Nags Head Golf Links. Blake (my girlfriend's sister’s boyfriend – say that 10 times fast) and myself, Ed. Blue skies, green grass, little bridge. Driving to the golf course we found ourselves in a little private community filled with gorgeous homes on stilts painted all the colours of the rainbow with the course peeking out here and there. When we pulled up the driveway to the course, the feeling switched to a more modern and professional space as the clubhouse looked nothing like the homes in the area. It would've been nice if the clubhouse represented the location and also had that "Outer Banks beachy" vibe to it. Upon pulling up, an employee (Ernest) was quick to get us a cart and our rental clubs. We were pretty surprised considering we hadn’t even made it inside to pay our green fees. The fee and club agreement process was quick and painless and we soon found ourselves staring down the luscious green fairway of hole number one. The clubhouse is built to be like a private members only country club. It has some older details and stuffy vibes to it such as private lockers, member only areas, etc., but despite all that the staff are still very welcoming to the public as were most players on the course. Panoramic view of one of the holes that sits on the sound at Nags Head Golf Links. This time around I cannot blame the rental clubs on my poor performance. They had given us some beauty Taylormade sets and I was actually performing better with those irons than the set I use at home. 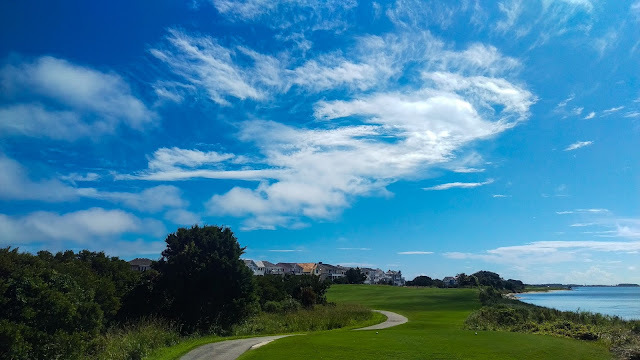 I will say though, when on a new course using rentals, stick to the clubs you know; I was trying out all the wedges on the early holes and gave myself a few extra strokes that I was not be able to get back. One disappointment of the course was that the score cards did not have a visualization of the holes. If you wanted a course map you would have to pay $5 at the club shop. To me, that just seems like a senseless cash grab. We did not know this before teeing off, so we ended up playing the course essentially blind and guessing where water and other hazards were. The course itself was in immaculate shape. The two days before we played there was a considerable amount of rain so the fairways and greens were very soft. So soft that carts were stuck to the path and any high-hit ball hitting the green had minimal roll. 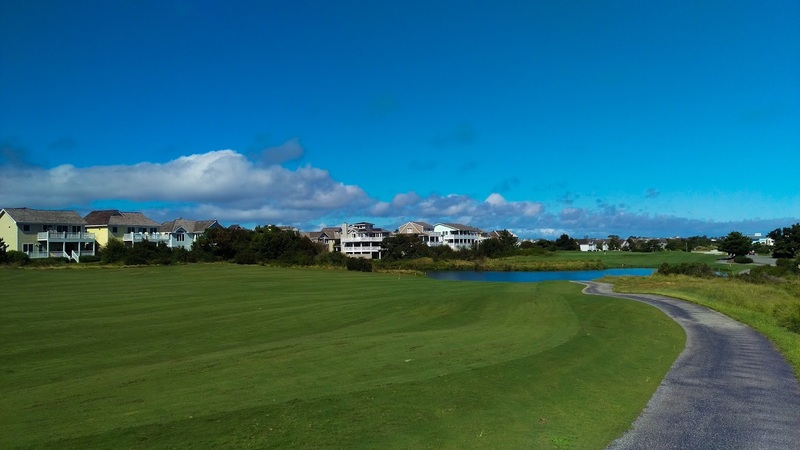 The course winds through a private community and a few holes are directly beside the sound. A large portion of the holes have water hazards which you will either have to play safe to avoid or be a demigod to clear. With that in mind, the course is tight as well, any stray balls will be lost forever. View from the tee box looking at a water hazard. Play short or crush it! We played an early morning round so we did not see any cart service and we bypassed the clubhouse at the 10th hole to keep up the pace we had going. I cannot comment on the offering here in that regard. However one thing I really loved was that every three holes they had a water station set up for the golfers. We needed it since the temperature was closer to 30 degrees celcius with very little wind. I personally took advantage and had three or four cups of water at each station. I wish more courses would offer this for golfers. Another hole, another water hazard. But those houses sure do look pretty! We paid $125 USD for the green fee, cart and club rentals which works out to approx. $160 CAD. This is probably the most I’ve spent on golf all year (outside of a tournament), but when you factor in rentals and a cart it really isn’t that bad. We got a solid three and a half hours of play time that was challenging, frustrating and rewarding all at the same time. After all, vacations are meant to be an experience, and golfing is just that. Road to the left, water and trees to the right. Hit your ball straight and true on this one. 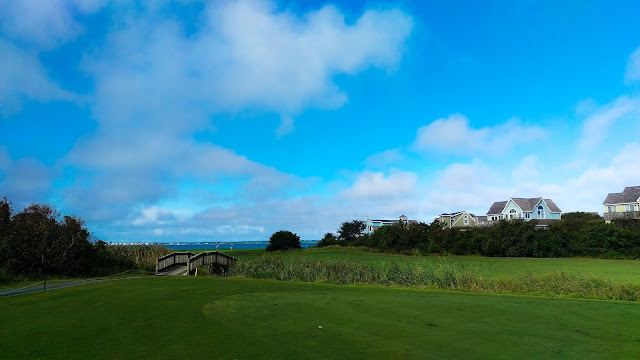 Nags Head Golf Links allowed us to play as a twosome, which was nice because it made the game go faster and allowed us to avoid the awkwardness of being stuck with strangers. The weather was perfect and the rentals were better than my own set of clubs at home. The staff were incredibly nice and the course was in tip-top shape. The course was a hell of a challenge and was frustrating beyond belief at some points. That said, it made hitting a perfect shot on a tough hole or tough lie that much more satisfying. The price may be steep for some travelers, but it was fine for a vacation splurge. Overall, I give this course a 4 out of 5. Have you ever golfed here? What were your thoughts on it? Let me know either on Twitter, Facebook or in the comment section below. Cheers! It's a great course and I'm glad you enjoyed it (I'm a member for full disclosure). It's tough and narrow, I wish you'd had the yardage book so you could strategize and recognize the course's unique layout. Each day is different depending on wind conditions, too, making its short approaches more difficult to calculate sometimes. You can play it well without a driver. 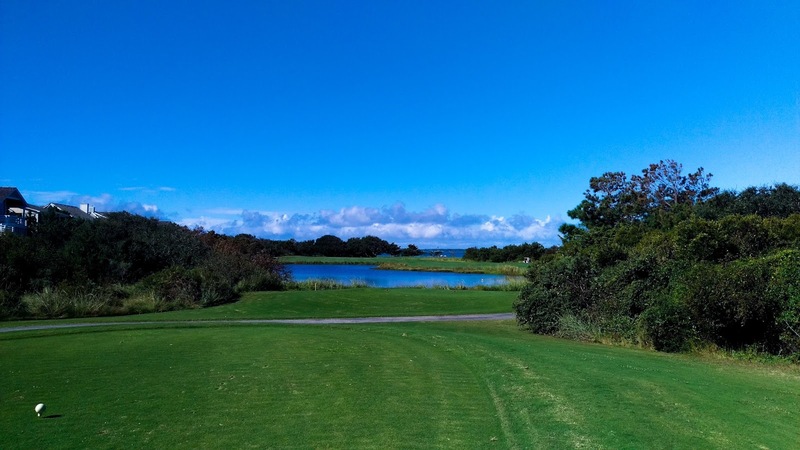 In fact, you can even use a 5-wood, hybrid or iron on many of the holes out of the tee box and would be wise to do so if you feel you can land a 120-150 yard 2nd shot. A much greater challenge than the 'grip it and rip it' approach, but it makes you think about your game more in my opinion. Props to the grounds crew who keep it it in tip top shape despite heavy play and uncertain weather, I've never had a complaint about course condition (unless I needed to explain a bad shot, of course). After a few holes we decided to play similarly to the twosome in front of us. They looked like they had played it a few times and knew better than us how to approach each hole. I couldn't quite connect with the rental driver the same way I would with my own personal one so I left it in the bag as much as possible. However the few times I tried it, it failed me or I failed it. Specifically on the 11th or 12th (the hole you tee off elevated and have to clear the pond) where I gave the fishes a scare. We hope to play again next year with a better idea of what we are going into. Would definitely get the booklet next time. Thanks for the comment and taking the time to reach out to us! I agree the views were quite nice. There's really nothing quite like golfing next to a large body of water. Thanks for the comment!